I made this shirt during the summer when I had way too much time on my hands and I wanted to experiment with reconstructing t-shirts. I bought a pack of 3 long white men's t-shirts to work with. I also decided to use some spray paint on the shirt and see how that worked out. 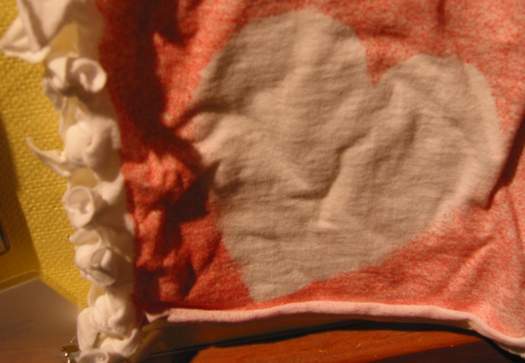 I created a little heart out of a piece of cardboard and placed it where I wanted to spray the shirt. I knew that I was going to be cutting away the sides and bottom to make it smaller so I placed it sort of near the bottom right side. Then I got out my red spray paint and sprayed all around it, concentrating more on the bottom corner and thinning out as I got to the center. 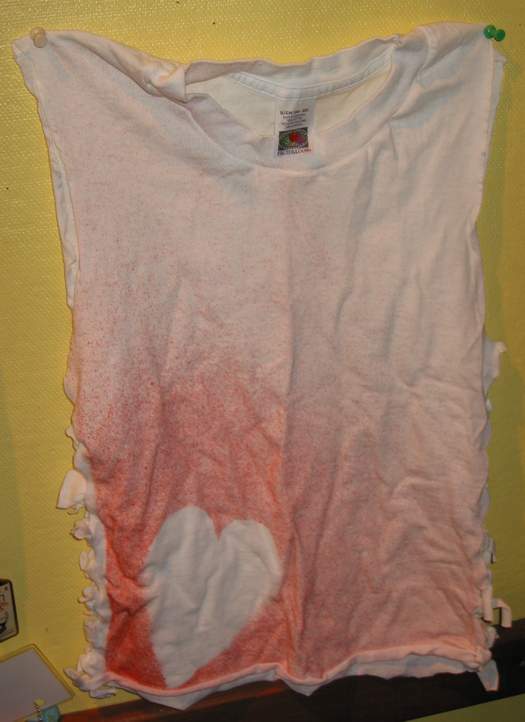 After it was dry (and it REALLY smelled) I cut up the sides of the t-shirt. Then I cut strips about one inch wide and several inches deep into the shirt. 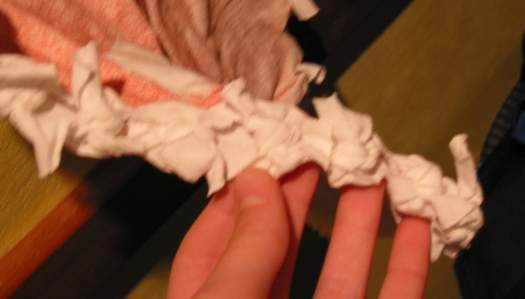 Then I tied the little strips together to make little knots. I did this all the way up each side. After it was done, it looked a little cool. When I tried the shirt on there were lots of holes where I had done the ties. I hadn't planned to wear this shirt ever, so I wasn't too disappointed with how odd looking it turned out. I have some more ideas of shirt reconstructing, which I'll probably do some day. Oh well, here some pics of the shirt.